August 15, 2018  Badu joins Stretch & Bobbito for a conversation about her daily visit to "the five doctors," how she became a certified doula, her desire to try stand-up comedy and getting critiqued by Prince. August 15, 2018  The singer's performance at the Tiny Desk was an almost spiritual experience, leaving many at the NPR Music offices in awe. July 28, 2016  The compilation features original songs by Nas, Erykah Badu, Pusha T, Jeremih, French Montana and more. May 3, 2013  Erykah Badu is far from your average pop star. Answering questions on stage in New York recently, she was more like a guru: She drew the audience close, received love and handled awkwardness with ease. April 14, 2008  With the release of New Amerykah: Part One (4th World War), Erykah Badu has an album New Yorker music critic Sasha Frere-Jones says is worth another listen. 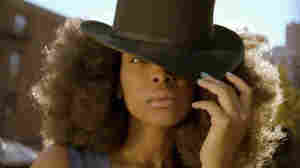 February 26, 2008  With her new CD Discipline, Janet Jackson leads a roster of new releases from veteran stars. Carl Wilson of the Globe and Mail looks at Jackson's album, plus new records from Dolly Parton and Erykah Badu.